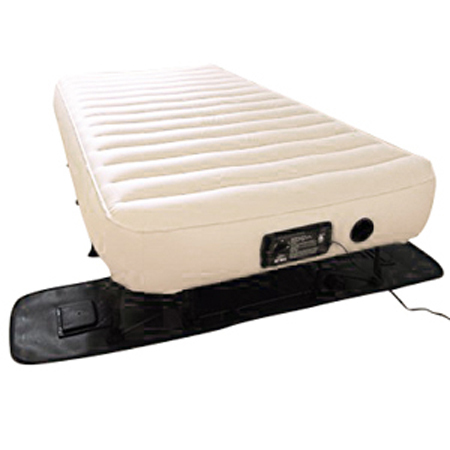 The final part of the top-trinity of Insta beds is the raised model with Insta III built-in pump. It’s been “duking it out” with the “neverFLAT” ever since we started out this Insta thread of guides a about 14 months ago. Below are the latest results of our tests and latest impressions our featured testers shared with us. Currently rated at 86 / 100, this air mattress has been one of the top picks among Insta air mattresses for as far back as we can remember. Right off the bat, we’ll take a look at new ratings throughout our relevant categories. If you’ve read our previous update on this Insta bed review, you’ll know exactly what happened that pushed the NeverFLAT to the top. They’ve kept it pretty basic, as with all their models we’ve reviewed over the years. This is not intrinsically a problem since we have a lot of testers for the three models we have in our storage, paired up with hundreds of recent buyers all around the world we’ve contacted in the past two months. All in all, I’d say we’re pretty “buffed” when it comes to relevant data, so let’s hit the ground running with some positive and negative user reviews of this Insta. Las time we used it, it went on for two weeks without needing any extra air. Not to mention our guests totaled more than 400 lbs together, and the bed remained as firm as the day I inflated it. Amazing! We can best get to know this model by comparing it to our winner for this update of the Insta guide. We’re talking the NeverFLAT one, of course. Where we can really learn about these two is in their differences, however. So, let’s see what sets them apart. The first thing we’d like to point out is the pump itself. This model doesn’t feature the NeverFLAT variety, which is a huge difference. The bed (luckily) doesn’t lose air over night, but neverFLAT is just a nifty “safety net” to have. It uses the same pump as the Serta with Insta III pump and the two are pretty similar in terms of specs but when we put the two under scrutiny of testing, the Insta came out on top. Insta III packs a bigger punch, however, so it all comes down to whether you want speed and power or an additional safety layer. The weight limit of this mattress is a thing we don’t particularly like. It’s set at 350 lbs, which can’t be enough for two grown ups. Some buyers have pushed their luck by putting more weight on it, and it went ok, but weight limits are there for a reason. Sure, air mattresses of today won’t disintegrate if you put some more weight on them, but they’ll definitely “feel it” in the long run. So, following manufacturer’s user manual definitely sounds like a good idea. Dimensions are also something we need to address. Twin is 100% true to size, so no problems there. Queen, however, should be 80 inches long, and it measures 78. It’s not a huge problem, but we need to mention all the irregularities about this model. You might have some issues with your Queen-Size sheets, but it shouldn’t be too big of a problem. The height is different as well. This bed is 15 inches high, which puts it 3 inches bellow its “arch nemesis”. Some people found it to be too low, but I guess we’re dealing with one more of those “personal preferences” type of things. Any extra info to keep in mind? It’s an air mattress recommended exclusively for indoor use. We know you fellow campers out there won’t exactly head this “warning”; neither did we. If you want to give it a shot in the great outdoors with this bed, make sure you have your power supply with you since this model can’t be battery operated. The main things that were supposed to draw you to buy it are its insane quality-to-price ratio and a ridiculously powerful pump. That, combined with some well-known Insta traits and features makes up for one pretty darn good inflatable bed. We’ve tested it outdoors as well, and it performed flawlessly, so you home won’t have a chance against it. A huge bang for the buck and we don’t think you’ll ever look back if you decide to go with one of these.